Andrew Stainton is the Business Placements Manager at the University of Huddersfield. His team won the Best University Placement Service at the NUE Awards 2017. So 2017 turned out to be quite a good year for the underdogs of Huddersfield. Promotion to the Premier League for Huddersfield Town after 45 years in the lower divisions, the University being awarded gold status in the TEF and the Business School’s Placement Office winning the Best University Placement Service accolade at the National Undergraduate Employability Awards. As you can imagine, there were quite a few surprises and for those of us who work in the Business Placement Unit, winning the award was pretty jaw dropping! As a team we were proud of our achievements - on the whole we felt we’d done a strong application and presentation but probably thought of ourselves as more a ‘work in progress’ than the finished article. Being a finalist for the previous two years, we knew how high the standards were and it was no shock that we were up against some pretty tough competition. Doing the application for the award was a good way to reflect on what we had achieved over the past year and for me, it acts as a motivator to keep on trying new things. 2016 was the second year we were invited to the head offices of M&S to pitch our case to the judges. You only get 7 minutes to present and we took the approach of being honest about the challenges we face and getting across our ideas and passion for the work we do. Luckily, Helen and Hazel from M&S are great at putting you at ease and making you feel comfortable. What’s so nice about the day, is that there is a really supportive and encouraging atmosphere amongst the shortlisted universities. We all know the trials and tribulations which come with the job so cheering each other on came naturally. We got the email the following week to say we were finalists; with the Awards being in February, it’s great having something to look forward to throughout the January gloom. I’m still northern enough to consider a trip down to London to be a bit exciting in itself and having avoided being assaulted on tube for the second year in a row, I should have spotted the good omen for us winning at the 2017 NUE Award ceremony. The NUE Awards are a great mix of business and pleasure. You get to network with employers and staff from other Universities, sample some fancy food and drinks plus hear some inspiring and insightful presentations. 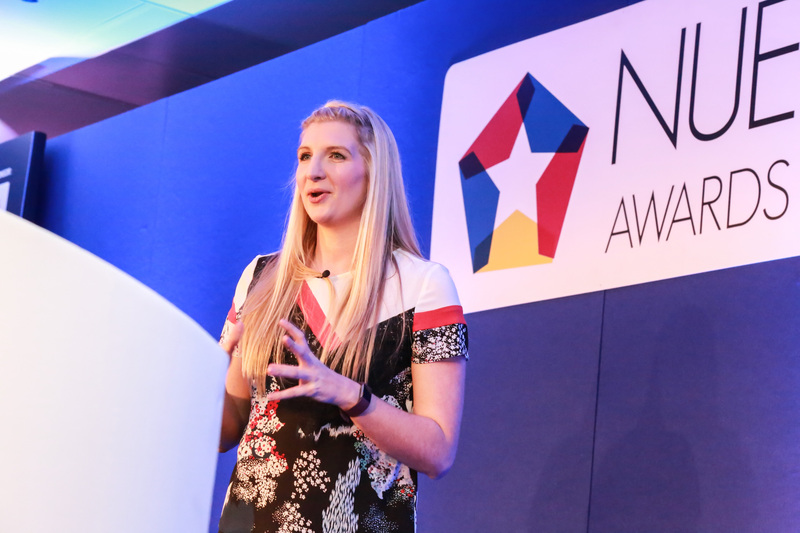 Double Olympic gold medalist Rebecca Adlington was the guest speaker for the evening; she was a combination of inspiring, funny and humble and in all honesty, I would have been happy enough to have met her and left as a runner-up. As the evening led into the ceremony and the announcement of the winners, the Best University Placement Service happened to be first on the agenda. As Rebecca read out some of our stats we knew it was us before the name was announced. (You can tell I never seriously thought we were going to win as I didn’t bother to wear a tie). I think the main reason we won was the fact that we have shown an ability to keep innovating and implementing ideas that address the factors that can hold our students back. Our pitch presentation played to the theme of achieving results despite a range of challenges. We’re not that well-resourced but we don’t let that limit our ambition for our service and our students. I feel that our determination to succeed, sometimes against the odds, impressed the judges. Winning the award has helped us raise the profile of the work we do in the BPU and encouraged the realisation that we do a lot more than just check CV’s! To find out how you can be involved in the NUE Awards 2018, visit our website.